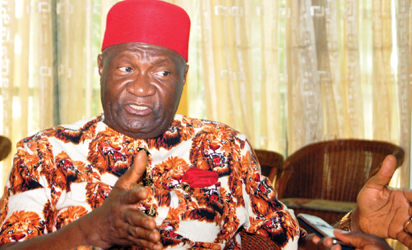 In a statement he personally signed, the President General of the umbrella body of Ndigbo Worldwide, the Ohanaeze, Chief John Nnia Nwodo stressed that actions of the government towards the people of the south East explained why the people are angry with the federal government. Reacting to the court-ordered release of Ndigbo women, the Ohanaeze President- General hailed the Judiciary for allowing reason and respect for human rights to prevail. The Ohanaeze leader who is recuperating abroad from a mild surgery warned Igbos against shooting themselves on the foot no matter the provocation. Chief Nwodo said that Ohaneze is pleased that reason and respect for human rights prevailed and that a little over one hundred women who were exercising their fundamental human rights could not conceivably be any threat to peace in Imo State. “I salute the courage of the Imo State judiciary and the professionalism of the State Attorney General. Never again shall we Igbos at this critical time shoot ourselves again on the foot. No matter how provocative, incindiary and unruly IPOB may be, they are our children. Aggrieved children can sometimes loose their guard. Nwodo who urged Imo State government to demonstrate some restraint in the future,said, “Here are young people described as terrorists for daring to speak out in the face of degradation, marginalization and inhuman treatment. Nwodo noted that Boko Haram loot, plunder, kidnap but, “the government negotiates with them spending unappropriated and undisclosed sums! Yet IPOB is proscribed for just speaking up. Arewa youths spoke treason and were defended by Governors and treated with privilege! “No wonder our security chiefs are appointed on the basis of where they come from. Any Igbos who is not angry at the situation in the country today must have his head reexamined. The Ohanaeze leader who admonished Governor Rochas Okorocha not allow his anger at IPOB’S verbal provocations override his paternity,said, “borrow a leaf from me. I am abroad and emerging from theatre for a mild surgery and I have read how it is being said that Ohanaeze and the South East governors masterminded you to detain our sisters but noted that the false propaganda did not stop me from directing Ohaneze Publicity Secretary from condemning the detention. “The provocation, double standards, and subjection to servitude far outweigh the denigration their false propaganda subject us to.